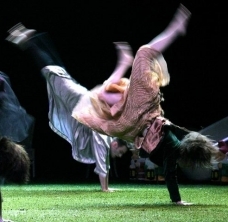 Konstantinos Rigos / Oktana Dancetheatre - The Rite of Spring :: TicketServices.gr " // + "
Konstantinos Rigos will be joining forces with a new squad of dancers,who will be dancing to the iconic music of Igor Stravinsky. The Rite of Spring is a legendary ballet that changed the face of dance with its avant-garde nature when it was first performed in Paris in 1913 as choreographed by Nijinsky. Greek National OperaΆs Ballet Director, Konstantinos Rigos, will be joining forces with a new squad of dancers and the Oktana Dancetheatre company who will be dancing against the iconic music of Igor Stravinsky, for a unique performance commissioned for the Summer Nostos Festival. The main work's theme revolves around a series of pagan rituals performed by ancient Slavic tribes celebrating spring, culminating in the sacrifice of a young maiden.